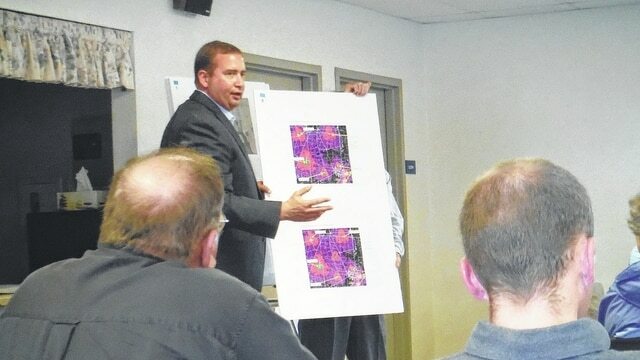 Rob Ferguson, an engineer for Verizon, shows residents where a proposed cellphone tower would be placed in Radnor Township. Radnor Township residents voiced their opposition to a proposed Verizon cell phone tower at a public hearing Tuesday. Representatives from Verizon Wireless spoke about the need for the tower before dozens of local residents at the Radnor Township Community Center. If built, it would be 310 feet high (5 feet higher than the Statue of Liberty) with a blinking light and located off River Road. Verizon real estate project manager Dan Noble said the telecommunications company can be penalized by the Federal Communications Commission if there are problems with the carrier’s 911 service. He also said there was data which indicates this is an area with a noticeable number of dropped calls. In addition, the company wants to stay ahead of the curve, he said. There is a two-year process to get a tower in place, the Verizon officials said. The property owners of an area where a tower is needed are contacted to see if they would be interested in leasing the land to Verizon (and possibly additional carriers). Preference is given to churches, schools, government and tribal properties. Depending on zoning, historic buildings and residential neighborhoods are avoided. When the Verizon team showed photos of how the tower would fit in with the existing countryside, residents began to ask questions. Several said they had no service problems with their Verizon phones within the township. One resident asked what the owner of the property was getting for leasing the property to Verizon. When the answer was “hundreds of dollars,” several were skeptical. “It’s wrong that one person can make a decision for money that hurts everyone else,” was among the comments. Others questioned the process, saying they weren’t contacted by the company about the meeting or received insufficient information. Noble said nine letters were sent to five contiguous property owners. There were also concerns about the noise, power demands, increase in traffic, effect on property values, and health risks from a tower. However, the most common comment was that residents didn’t want the tower in their backyard, and that it would spoil their view. Because of the public opposition, Delaware County commissioners recently approved a measure that subjects the location and construction of the tower to the county’s zoning resolution. Zoning Department supervisor Fred Fowler said Radnor Township uses the county for zoning issues. He said he hasn’t received an application yet from Verizon.